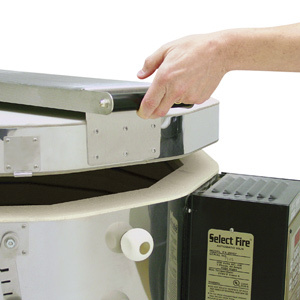 Excel's new series of Excel 22" Deep Select Fire Kilns was designed to make loading and unloading easier for younger students and potters who are shorter in stature. Measuring 4" deeper than other models, the kilns are still easy to access, and available in a variety of chamber sizes. Available in 240V or 208V, and in Single Phase or Three Phase models, the exterior of the EX-353 measures 36"H × 35"W × 28½"D. Its interior dimensions are 22"D × 22½"Dia, with a firing chamber area that measures 5.25 cu ft. It fires up to Cone 10 (2381°F). The EX-353 weighs 265 lb. ® Amaco is a registered trademark of American Art Clay Company.® Excel is a registered trademark. ™ Select Fire is a trademark. ™ EX-Lift is a trademark.